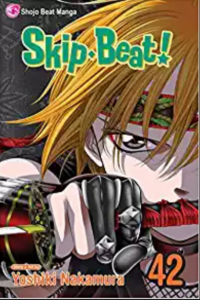 With such a long running series like Skip Beat! once it has caught up with Japan, the wait between volumes is long enough that I temporarily lose track of of the plot. But within just a few panels, my memory gets triggered and I’m back in the story again. In this case seeing Ren’s reaction to learning that Sho kissed Kyoko made the wait between volumes all worthwhile. It is always amazing how well Nakamura can portray someone attempting to be stoic when they are filled with turbulent emotions. Kyoko meanwhile has her own battles to fight, and Skip Beat! always excels when she has to fight for a role. She’s in the middle of a rigged contest, trying to get a role alongside her beloved Moko. Kimiko, the niece of the producer, is determined to use any advantage against Kyoko and she plays up an imaginary relationship with Ren just enough that Kyoko becomes totally distracted and forgets to focus when she’s receiving directions for the next stage of her audition. Moko ends up saving Kyoko by altering her body language just enough that Kyoko is able to intuit the rest of the scene, and she ends up turning in an impressive performance. One of the most entertaining part of this volume was seeing Ren’s manager accompany Kyoko throughout the audition process. His interior thoughts as he observes Kyoko’s reactions and starts building up theories about Ren and Kyoko’s relationship are priceless. As the audition progresses, Kyoko is able to battle through her emotional turmoil and fully inhabit her character. One of the things about Skip Beat! that I enjoy so much towards the start of a story arc is being able to look forward to all the impending drama. Kimiko seems to be engaged in a strategic retreat, I’m guessing that she’ll return to cause even more chaos. Ren and Kyoko haven’t met yet since Sho kissed her, so I’m looking forward to that scene, I’m guessing in two more volumes or so? Skip Beat! always manages to draw the reader in, and even though the big confrontations and resulting emotional growth for the characters doesn’t happen right away the series always delivers.